Wanda May Vinson Scholarships are awarded annually to graduating seniors who have provided outstanding leadership in the Kansas Association for Youth, achieved high scholastic standing and have made contributions of service to their school and community. 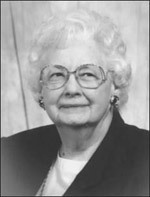 Wanda May Vinson founded the Kansas Association for Youth and directed the organization for 36 years. Through her guidance the KAY program became a nationally acclaimed organization which has provided thousands of Kansas youth the opportunity to receive leadership training and to assume citizenship responsibilities by serving their school, community, nation and world. The money for these scholarships are made possible through gifts from the Kays and Kayettes of Kansas and by other supporters of the Kansas Association for Youth. A large donation each year is received from campers at KAY Leadership Camp and at fall Regional Conferences. 2018 marks the 61st year of awarding Wanda May Vinson Scholarships. During this span of time, five hundred and forty-two students have received these scholarships, this year reaching a total amount of $122,000.00.